S.T.E.M., which stands for Science, Technology, Engineering, and Math, has become a popular acronym used amongst educators, and for good reason: S.T.E.M.-field careers are some of the most lucrative and have the greatest job growth potential in the early 21st century. The S.T.E.M. philosophy is holistic: It seeks to revolutionize how math and science are taught by integrating technology and engineering into the classroom experience. In addition, it attempts to refocus the classroom away from a teacher-centric model toward a student-driven discovery process, where problem-solving and hands-on exploration are the child’s instructors. Instead of treating math and science separately, they are blended so that students develop real-world problem solving skills. No more asking the teacher, “When am I ever going to use this?” The hope is that students will understand at a basic level how science and math apply to their world. HMNS embraces the S.T.E.M. philosophy wholeheartedly in our approach to education. Two of our most popular summer camps, LEGO Robotics and Advanced Robotics, are great examples of this approach. And now, HMNS offers a similar S.T.E.M. experience during the school year! Children gain the educational edge that S.T.E.M. provides and have a blast in the process — without having to wait for summer camp or worry about early registration. 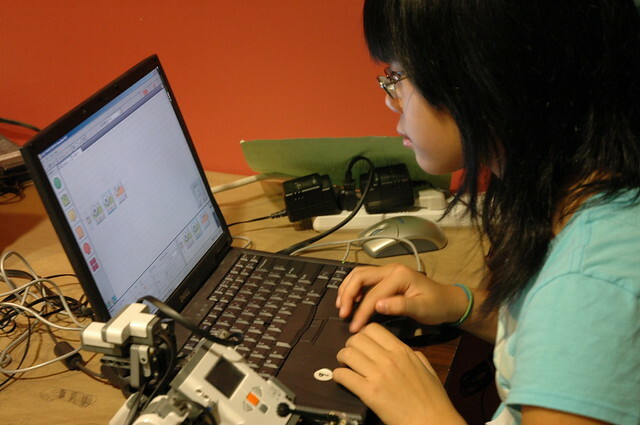 In our after-school program, children collaborate with a partner to construct models using the LEGO MINDSTORMS NXT™ system, then use brand new laptops to program the models to obey commands. They are given specific challenges and engage in friendly competitions to further hone their programming skills. Don’t let your child miss out on this multidisciplinary, collaborative, and authentic learning opportunity. To learn more about LEGO Robotics at HMNS (Sept. 11 through Nov. 13) and HMNS Sugar Land (Sept. 13 through Nov. 15) and register for class, click here!